At Ian Weigh Toyota there is a strong commitment from all staff, in terms of looking after the environment. Recycling is an extremely important aspect of this commitment. Our Environmental Control Officer is responsible for the co-ordination of the following recycling activities that are participated in daily by all Ian Weigh Toyota staff members. Aluminium Cans Cans are submitted to Just Scrap It Pty Ltd for reuse. Milk & Juice Plastic Bottles (Codes1,2,5) Submit to The Rockhampton City Council for recycling. Paper Scrap Paper is schredded and is either used in our Despatch Department as packing material or is submitted to The Rockhampton City Council for recycling. Unshredded Scrap Paper still in good condition is donated to local Day Care Centres. Cardboard Boxes Boxes are either submitted to the Rockhampton City Council for Recycling or are re-used as packing materials in our Despatch Department. Scrap Metal Pieces from our workshops Metal Pieces are submitted to Just Scrap It Pty Ltd for reconditioning and reuse. Used Batteries Batteries are submitted to Just Scrap It Pty Ltd for recycling. Key Rings for both New & Used Vehicle Departments Continually Re-used by Ian WeighToyota. Wooden Pellets from Parts Packaging Submitted to The Rockhampton City Council for recycling. Ink & Toner Cartridges Recycled using Planet Ark Reycling Boxes. Paper Car Floor Mats from our Service Departments Submitted to the Rockhampton City Council for Recycling. Used Envelopes Re-used for Internal Mail between the Rockhampton & Yeppoon Dealerships. Newspapers/Magazines Submitted to the Rockhampton City Council for Recycling. To raise this Dealership’s focus on a ‘Green’ working environment. To develop environmental policies and procedures. To investigate new environmental policies. To monitor the progress of new environmental policies. To conduct audits of existing environmental policies. To issue warnings for non-adherence to environmental policies. 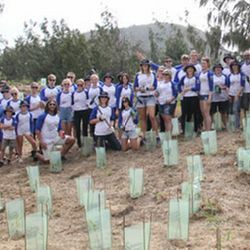 On top of these environmentally friendly focused activities Ian Weigh Toyota in partnership with the Rockhampton City Council assists in the co-ordination of Rockhampton’s National Tree Day activities. National Tree Day is an Australian environmental initiative aimed at promoting community planting of native trees and shrubs. It is organised by Planet Ark in association with Toyota and AMP foundation. 2007 marks the 8th year that Toyota has been a major presenting partner of National Tree Day. Ian Weigh Toyota is a proud supporter of School’s Tree Day and National Tree Day held in July. Each year our staff supports the School’s Tree Day event with a sausage sizzle for the School children to enjoy after their busy morning filled with planting trees. Ian Weigh Toyota supports National Tree Day at Mulambin Beach each year with many staff giving up their Sunday morning sleep-ins to assist in planting thousands of trees at the site. 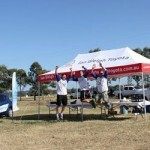 Ian Weigh Toyota also supports the event by providng a complimentary sausage sizzle and Hybrid Vehicle Display. At the 2013 event we also had the special perfomance by Toyota Ambassadors Luke Austen and Luke Dickens from Men Of Country . Last year more than 316,000 Australians supported National Tree Day, including 250,000 school children. They planted 1.6 million trees, shrubs and grasses at 3,600 sites. Ian Weigh Toyota were one of the 145 Toyota Dealers who helped to achieve this exceptional result.